Jerry Chambers. Credit: Abby Schreiber. Jerry Chambers has managed Collingswood’s Scottish Rite Theatre for 16 years, helped revive its business district, and co-founded May Fair. Jerry Chambers in the Scottish Rite. Credit: Abby Schreiber. In the mid-1990s, an article proclaiming the borough “the 43rd-worst place to live in New Jersey” sent local officials and business owners scrambling to combat that impression. 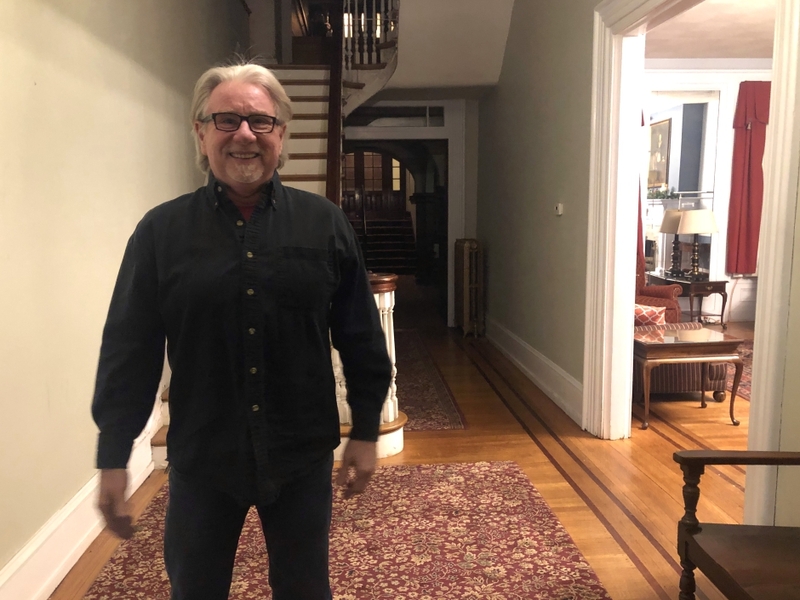 At the center of that revitalization was lifelong Collingswood resident Gerard “Jerry” Chambers, a longtime business owner, community volunteer, and a man who’s been there to see it all transformed. As he approaches a planned July retirement, we acknowledge Chambers as our 2018 NJ Pen Townie Award recipient for Outstanding Public Employee. Chambers, 68, hails from a family of nine, which he said was common in 1950s Collingswood. Chambers’ passion for Collingswood stems from that sense of community, and it inspired him to get involved. He picked up a paper route at the age of 11; by 12, he was running a lawn-cutting business. 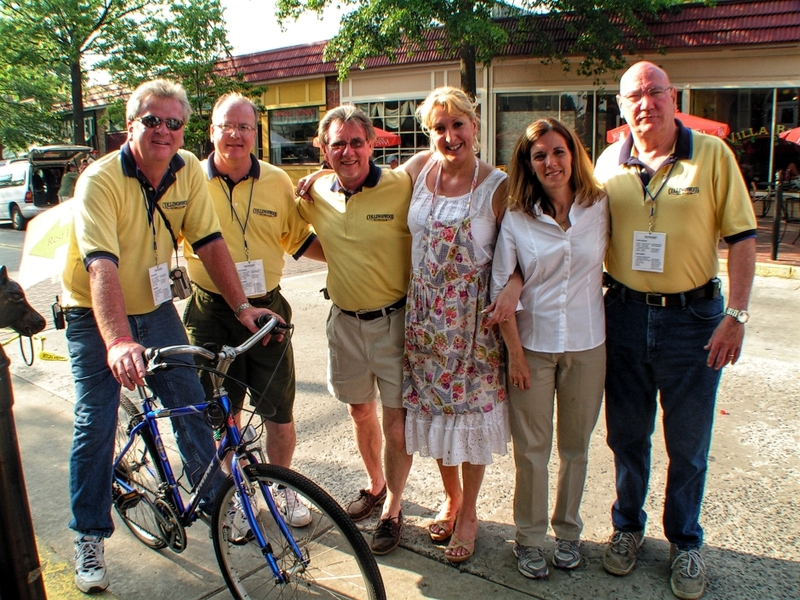 Jerry Chambers (third from left) with a crew of local volunteers. Credit: Borough of Collingswood. That enterprising streak landed him his first job on Haddon Avenue, working as a cleanup boy for Al’s Mens and Boys Store. From that point forward, Chambers was a member of the Collingswood business district. “When people get attached to a community, they seem to be magnetically attracted to a part of it,” Chambers said. From 1974 until 2010, Chambers operated a successful jewelry store on Haddon Avenue. He was the original president of the Collingswood Business Group, precursor to Collingswood Partners, the borough business improvement district (BID). Chambers also has chaired the planning committee for May Fair, the town-wide, summer kick-off block party since its inception, and has served as the director of the Scottish Rite Auditorium for 16 years. He’s seen the borough emerge from the quaint, postwar community of his youth to the vibrant Philadelphia suburb of today. And in 1976, the business group did just that, planting the first trees on Haddon Avenue and revitalizing the look of the strip. Three years later, the group had its biggest, and longest-lasting promotional idea. It began humbly, as a clothesline art exhibit in front of Arts Plus Gallery in 1979. The following year, Chambers added vintage cars to the mix, and officially coined the “May Fair” name in 1980. He’s chaired the event committee every year since. 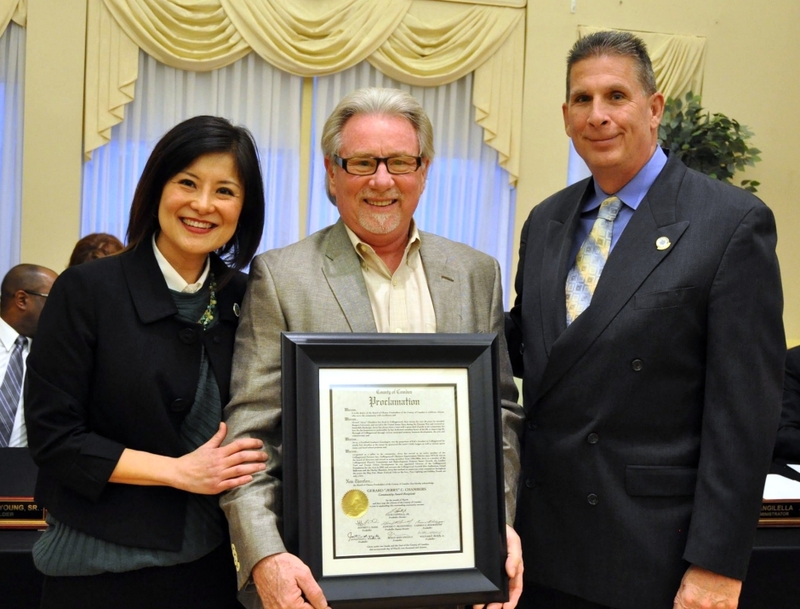 Jerry Chambers (center) receives a commendation from Camden County Freeholder Susan Shin Angulo for his volunteerism. Credit: Camden County. “We then added music,” he said. “Then we needed more room, so we added a block,” he said. Eventually it became “a mile-long block party,” Chambers said. The downtown revitalization swung into full gear in the mid-1990s, when negative press criticized Collingswood as a subpar community. Chambers recalls that moment as galvanizing local government and business owners around the idea of restoring the borough character. “That allowed us to hire somebody to buy banners, market the town, all of the things that we didn’t have the money to do,” Chambers said. The introduction of the BID was not unanimously welcomed, but it paid off. The 1990s saw Collingswood begin to net families seeking the same “village” mentality Chambers experienced as a child. “Now, 25 years later, we’re seeing a huge resurgence,” he said. In so many ways, Chambers has worked to foster that same feeling of community he felt as a child in every visitor to the borough. Through his work with Collingswood Partners, he’s assisted in the establishment of the Collingswood Farmers Market, the borough tree-lighting and Easter egg hunt events, and many more Collingswood staples. 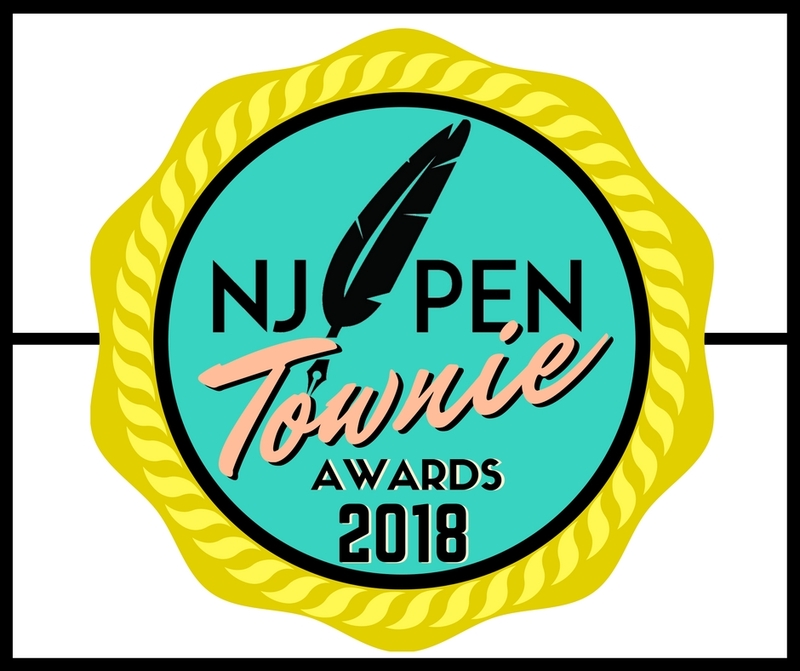 The NJ Pen Townie Awards were conceived as an antidote to “Best Of” ballot-stuffing popularity contests. Reader nominees in five categories—Local Hero, Small Business that Changed My Life, Most Welcoming Space, Outstanding Public Employee, and Teacher Who Made a Difference—will be featured in future stories. Stay tuned for our final installment.